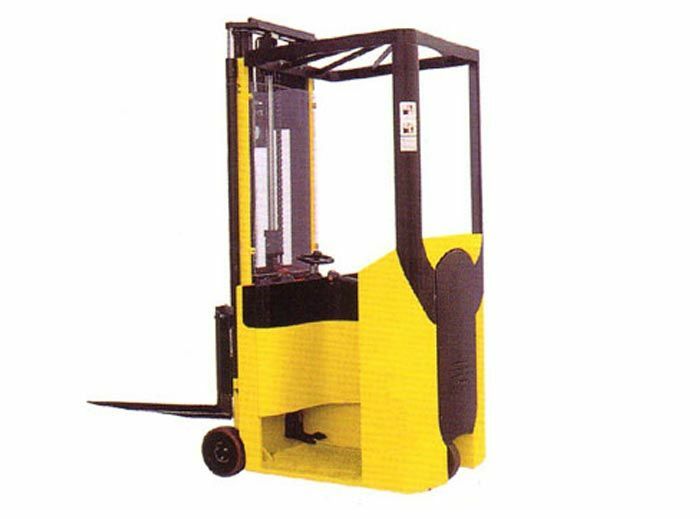 CPD-X Narrow Aisle Forklift - Products - SINOLIFT MATERIAL HANDLING EQUIPMENT CORP. Product Introduction：Electromagnetic brake mechanism and frive power motor braking improves overall effciency and prolongs brake component life.Advancef control system with MOSFET delivers smooth driving speed control for percise positioning of the truck. ?¤ Turning radius 1140mm,lower noise,no pollution. ?¤ Electromagnetic brake mechanism and frive power motor braking improves overall effciency and prolongs brake component life. ?¤ Advancef control system with MOSFET delivers smooth driving speed control for percise positioning of the truck. ?¤ Hydrostatic power steering provides quiet,effortless and responsive operation for precise manoeuverability. ?¤ With regenerative braking system for driving and electronic braking system for parking. ?¤ Advanced AC control system with MOSFET delivers smooth driving speed control for precise. ?¤ Small turning radius,easy and smart to operate. ?¤ Lean-on compartment offer comfortable and safe driving position,reducing operator's fatigue. ?¤ Low battery Protection setting prolongs service life in reversing mode and reduce the brake pedal using and reduce operatot efforts. ?¤ With deadman switch on floor to cut off the power when operator leave the from cab. ?¤ Lifting cylinders on the both of mast provides best visibility. Sinolift reserves the right to make any changes or modifications of pictures and specifications without giving previous notice and without incurring any obligation.